Current understanding of the surgical factors that influence risk of nonunion remains limited. Choice of fixation continues to be largely reliant on surgeon preference.10,11 Consensus on patient risk of revision based on the method of surgical fixation is lacking. The authors hypothesize that the type of internal fixation influences the rate of nonunion and other complications in proximal femur fractures. The aim of this study was to characterize nonunion rate and other causes of reoperation in adult proximal femur fractures after primary internal fixation, especially since the year 2000. In October 2017, a literature search was performed using PubMed, Embase, and the Cochrane Review system. All studies tagged with the Medical Subject Headings term “femoral fractures” and all studies with “femoral fractures” or “femur fracture” in the title or abstract and “wound healing,” “fracture healing,” “bony callus,” “treatment outcome,” or “recovery of function” were included. In addition, studies with one of the following terms in the title or abstract were included: “non-union,” “nonunion,” or “non union.” Search filters were added to eliminate case reports and studies involving animals, infants, children, or adolescents. Studies involving the following were excluded: 20 or fewer fractures; patients younger than 18 years; a series of nonconsecutive patients; fractures other than of the femur (ie, mixed series of long bones); missing outcomes of interest (ie, nonunion rate); conservative management (ie, traction or external fixation) as definitive treatment; arthroplasty (ie, eliminating fracture nonunion as an outcome); disease-related pathology (eg, chronic steroid use, autoimmune disease, end-stage renal disease, congenital bone disease, long-term use of bisphosphonate); abnormal fractures (eg, cancer-related pathological fractures; stress fractures; bisphosphonate-associated fractures; iatrogenic, perioperative, or periprosthetic fractures); novel fracture management techniques (eg, primary bone grafting); duplicate studies (eg, multiple reports from the same patient population); aggregated data from intracapsular and extracapsular proximal femur fractures; aggregated data from more than 1 type of fixation method (ie, nails, plates, or neck-based fixation); and rare fractures or fixation methods (ie, femoral head fracture, triangle nail). On compiling articles that met all inclusion criteria, studies on distal and diaphyseal femoral fractures were removed for separate analysis. Results presented in this article are for proximal femur fracture data only. Several definitions were used in the analysis. Intracapsular fractures were femoral neck fractures. Femoral head fractures were excluded. Extracapsular fractures were basicervical, intertrochanteric, and subtrochanteric fractures. Basicervical was base of the femoral neck at the junction with the intertrochanteric. Intertrochanteric was proximal femur between the greater and the lesser trochanters. Subtrochanteric was distal to the trochanters, primarily in the cortical bone. Neck-based fixation was percutaneous fixation, indicating placement of 1 or more cancellous screws, pins, or nails into the femoral neck without an associated plate or intramedullary nail for stabilization. Plate was sliding hip screw, reverse less invasive stabilization system, blade plate, locking plate, and so forth. Nail was cephalomedullary nail, intramedullary hip screw, non-locking rods, and so forth. Healed fractures equaled total number of patients treated minus number of failures. Failures equaled sum of all nonunions plus other unplanned reoperations. Total reoperations equaled number of reoperations for nonunion plus number of other unplanned reoperations. Data were analyzed using t tests and z scores, with significance set at P<.001. The authors did not adjust for multiple comparisons because P<.001 is comparable to P=.05 if Bonferroni corrected for 50 comparisons. Correcting for additional comparisons would be likely to lead to type II (false-negative) errors. In an exploratory context such as this, P values should be interpreted as a measure of statistical evidence rather than as a test of hypothesis. A total of 215 studies met inclusion criteria (Figure 1). Of these, 94 studies were prospective and 121 were retrospective. 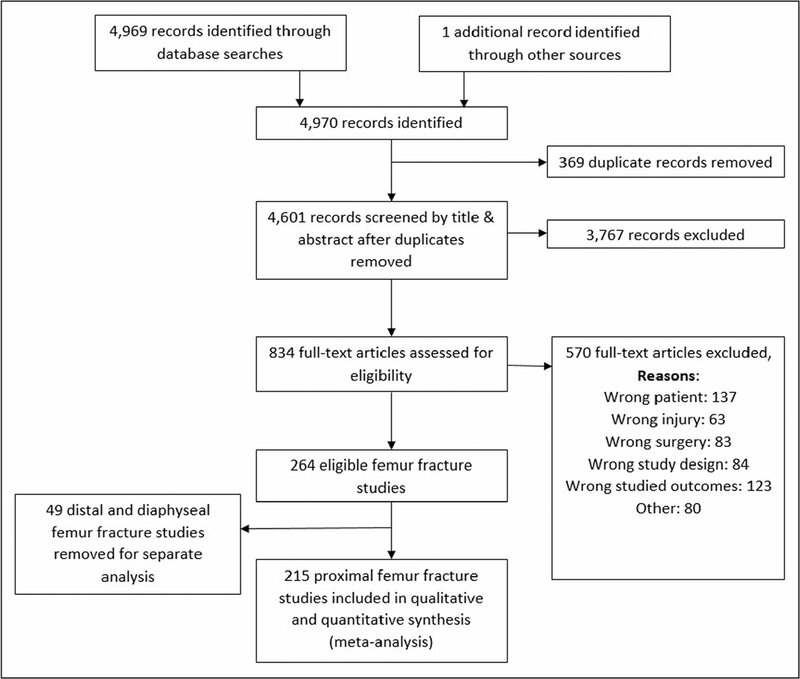 Included studies had publication dates ranging from 1973 to 2015 and provided outcome data on 25,104 patients with 25,192 fractures. Of these, 187 studies with 17,110 fractures were published from 2000 to 2015 and were the primary focus of analysis. Studies on intracapsular fractures published between 2000 and 2015 had lower nonunion and reoperation rates than studies published prior to 2000 (Figure 2; P<.0001). There was no difference in nonunion or reoperation of extracapsular fractures in studies published prior to 2000 compared with studies published from 2000 to 2015 (Figure 3). Preferred Reporting Items for Systematic Reviews and Meta-Analyses diagram of the references used in this analysis. Intracapsular fracture heal rate as a function of year of publication. Extracapsular fracture heal rate as a function of year of publication. Healing occurred in 85.9% of fractures fixed with plates and in 84.4% of fractures treated with neck-based fixation. Approximately 14% of all intracapsular fractures required reoperation, regardless of treatment with a plate or neck-based fixation. Nonunion developed in 7.0% of fractures treated with neck-based fixation and 4.6% of fractures fixed with a plate (Table 1). Subsequently, 6.2% of fractures with neck-based fixation and 4.4% with plate fixation underwent reoperation for nonunion. Although there was no difference in total reoperation rate between neck-based fixation and plate fixation, plate fixation had higher revision rates for hardware migration resulting in cut-out or penetration of the femoral neck (2.4% vs 0.4%; P<.0001). Neck-based fixation trended toward higher rates of delayed union, but the difference was not significant at P<.001 (0.8% vs 0.0%, z=2.02). Other causes of reoperation were not significantly different between plate and neck-based fixation methods. 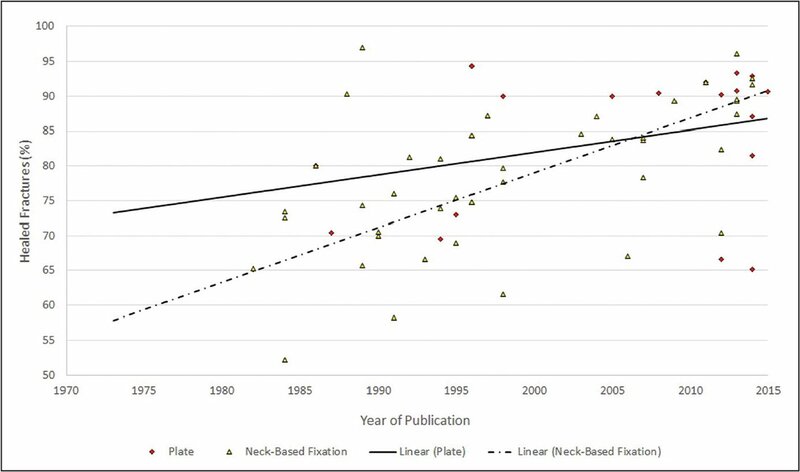 Neck-based fixation of displaced fractures trended toward a lower healing rate than plate fixation (70.4% vs 89.5%, z=2.63) and a higher total reoperation rate (29.6% vs 9.8%, z=2.79; Table 1). Nonunion was higher in displaced fractures treated with neck-based fixation than with plate fixation (29.6% vs 6.8%, z=3.51, P<.001). Neck-based fixation of displaced fractures also had higher rates of nonunion than neck-based fixation of nondisplaced fractures (z=5.25, P<.0001). 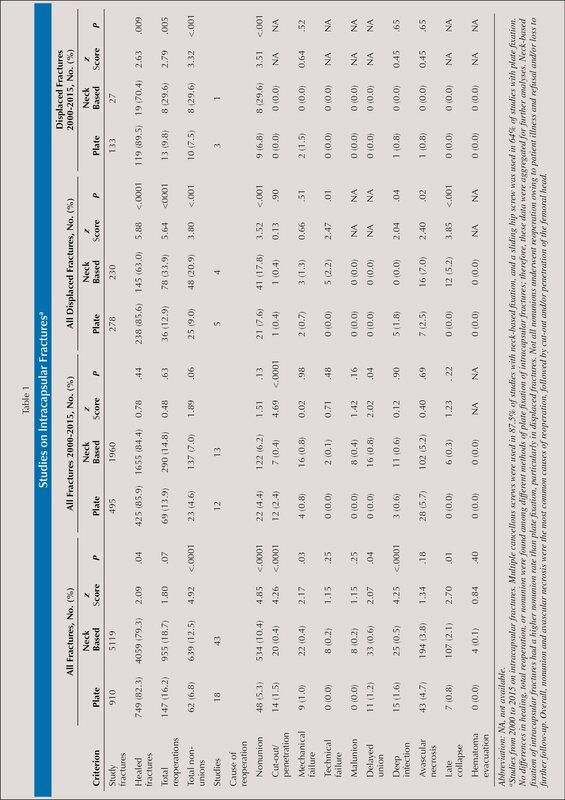 No difference was found between nails and plates regarding nonunion or reoperation rate (Table 2). Fixation migration resulting in cut-out or penetration of the femoral head was the most common complication, occurring in 2.2% of all extracapsular proximal femur fractures and accounting for 43.1% of all reoperations regardless of fixation method (Figure 4). No other complication, including non-union, affected more than 1% of extracapsular proximal femur fractures. Major causes of reoperation in pertrochanteric and subtrochanteric fractures. Among pertrochanteric fractures, plates had a higher rate of mechanical failure than nails (1.1% vs 0.3%, z=5.34, P<.0001; Table 3). 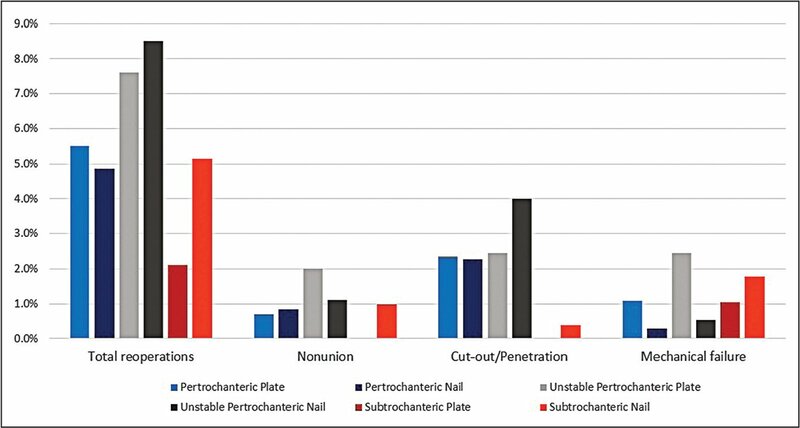 The rate of mechanical failure was significantly higher for plates than for nails in unstable pertrochanteric fractures (P<.0001), although there were insufficient data to determine whether this was also true for stable pertrochanteric fractures. 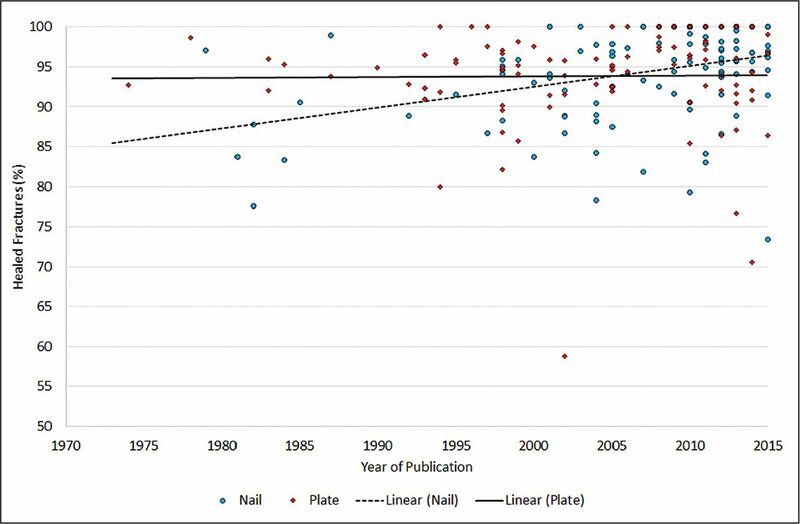 There were no differences between plates and nails for subtrochanteric and basicervical fractures (Table 3); however, analyses were limited by the small number of studies published from 2000 to 2015 that met inclusion criteria. Overall, the rate of mechanical failure for all pertrochanteric fractures was approximately 1%. Studies on unstable fractures showed a higher incidence of nonunion after plate fixation than after fixation with a nail (3.0% vs 1.2%, z=3.36, P<.001). However, reoperation for nonunion was not different between the 2 fixation methods for unstable fractures (2.2% vs 1.1%, P=.02), as not all patients underwent reoperation for their nonunion (Table 2). Plate fixation of unstable fractures also had a higher reoperation rate for mechanical failure than did fixation with a nail (2.2% vs 0.5%, z=4.07, P<.0001; Table 2). There was no difference in healing or overall reoperation rates in unstable fractures related to treatment with a nail or a plate. 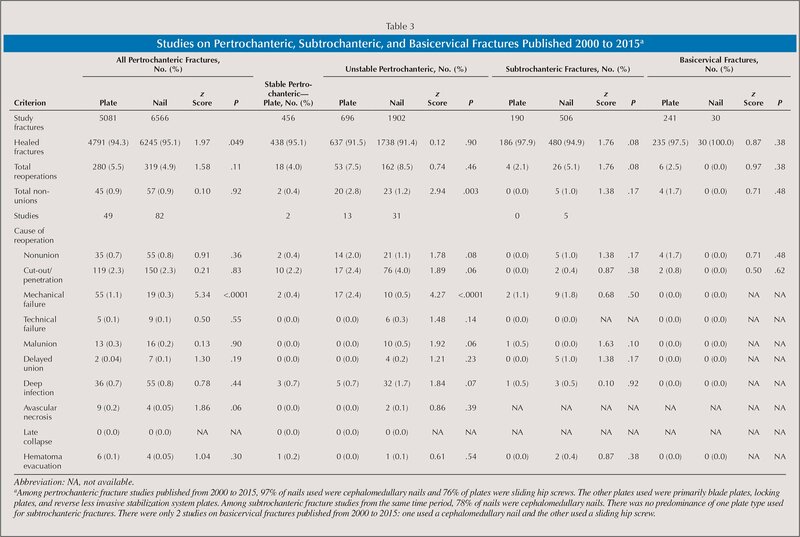 Among studies exclusively on unstable pertrochanteric fractures (Table 3), mechanical failure remained higher in fractures fixed with plates than with nails (2.4% vs 0.5%, z=4.27, P<.0001). Nonunion was higher in unstable pertrochanteric fractures fixed with a plate than with a nail, but the difference did not reach the required level of significance (z=2.94, P=.003). Patients with extracapsular hip fractures were older (mean age, 74.8 years; range, 18–105 years) than patients with intracapsular hip fractures (mean age, 65.9 years; range, 18–106 years; t=3.8, P<.001). Studies on extracapsular fractures also had shorter follow-up (mean, 1.6 years) than studies on intracapsular fractures (mean, 3.6 years; t=5.2, P<.0001). This was associated with a higher drop-out rate due to death or loss to follow-up among patients with extracapsular fracture (19.1%) compared with patients with intracapsular fracture (4.8%; z=3.11, P<.01). Uncomplicated healing after fixation occurred in 84.7% of intracapsular fractures and 94.7% of extracapsular fractures (z=18.4, P<.0001). Intracapsular fractures had a total reoperation rate of 14.6%, whereas extracapsular fractures had a total reoperation rate of 5.3% (z=17.5, P<.0001). Fixation failure was due to nonunion in 5.9% of intracapsular fractures and in 0.8% of extracapsular fractures (z=18.8, P<.0001). Nonunion comprised most failed fixations in intracapsular fracture (40.1%), but was present in only 15.8% of failed fixations in extracapsular fracture (z=8.92, P<.0001). Avascular necrosis occurred in 5.3% of intracapsular fractures and 0.09% of extracapsular fractures. Proximal femur fracture is a morbid event.12–14 Patients with intracapsular fracture are younger than patients with extracapsular fracture (P<.001), which may be due to preferential use of arthroplasty in elderly patients with intracapsular fracture.15 Intracapsular fractures generally have a higher nonunion rate and a higher overall reoperation rate than extracapsular fractures (P<.0001), although patients with intracapsular fractures tend to be younger. Nonunion rates are highest in displaced intracapsular fractures treated with neck-based fixation compared with plate fixation (P<.001). This suggests that increased use of plates may improve healing rates in intracapsular fractures. Among extracapsular fractures, the percentage of patients who healed without complication was comparable for fixation with nail (94.9%) or plate (94.5%). Avascular necrosis of extracapsular fractures is a rare complication that is reported in unstable fractures.16–19 Plates have a higher rate of mechanical failure than nails in studies that include unstable fracture types (P<.0001). This suggests that nails are superior to plates for extracapsular hip fracture. Recent data (2000–2015) indicate that neck-based fixation of displaced intracapsular fractures has a high rate of nonunion compared with plate fixation (P<.001). This suggests that increased stabilization of previously displaced fractures by a plate is necessary for healing. There is also evidence to suggest that plates (typically, sliding hip screws) have higher rates of healing in vertically oriented (Pauwels III) fractures.22 Thus, high-risk intracapsular fracture types have better outcomes when treated with plate fixation. Historically, rods such as the Ender nail and early iterations of the cephalomedullary nail were inferior to plate-based constructions for fixation of extracapsular proximal femur fractures.23,24 Since the transition to modern cephalomedullary nails, nonunion rates have become comparable between nails and plates (Table 2). The most recent Cochrane Review25 reported no difference between intramedullary nails and sliding hip screws regarding nonunion, infection, or mortality. However, plates were judged superior for extracapsular fractures because of an increased risk of perioperative fracture propagation by the nail.25 The current authors were unable to quantify the incidence of iatrogenic fracture from insertion of a nail because this was rarely reported. Nonunion trended higher in unstable pertrochanteric fractures after plate fixation (P<.003). Plates have a higher revision rate for mechanical failure in unstable pertrochanteric fractures (P<.0001; Table 3). 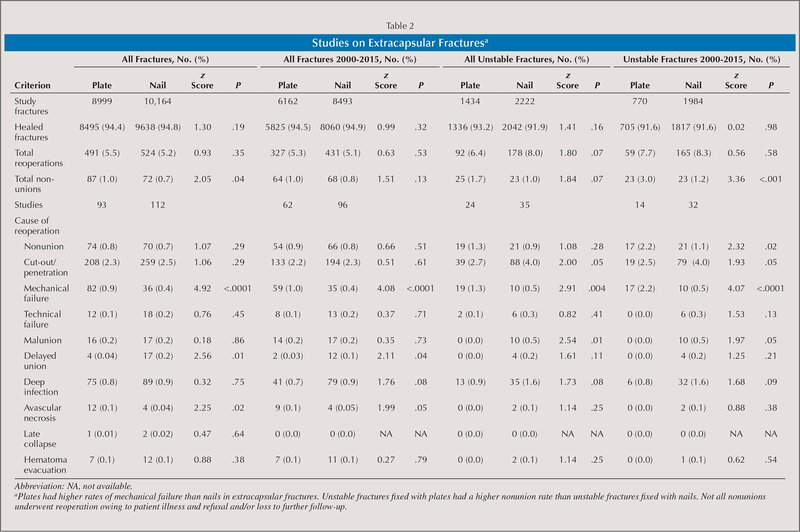 However, the authors found no difference in nonunion or total reoperation rates when comparing nails with plates in unstable extracapsular fractures.26–28 This suggests that if fracture propagation in nailed fracture does occur, it may have no significant impact on healing. The most important considerations in choosing fixation hardware are time to full rehabilitation, the morbidity of complications, and the risks involved in revision surgery. Patients treated with a plate have delayed ambulation and a low but significant incidence of mechanical failure because of the load-bearing properties of plates. Patients treated with nails, however, are able to rehabilitate more quickly, as nails are load bearing and permit early ambulation.29 In addition, revision of a plate often requires a more extensive approach and greater limitations on weight bearing. In contrast, revision of a nail is less invasive, and patients typically retain the benefit of being able to ambulate soon after surgery. These differences are important in choice of fixation method and suggest that surgical morbidity in extracapsular fractures may be lower for nails than for plates, particularly in unstable fractures. Although overall 1-year mortality rates for all hip fractures range from 15% to 30% internationally,30–32 data are mixed as to whether there is a difference in mortality between intracapsular and extracapsular hip fractures.10,13,33–35 Increased mortality in patients with trochanteric fractures was reported to become significant at more than 2 years after surgery, even after adjusting for increased patient age.36 The current authors found that patients with extracapsular hip fractures were significantly older and more likely to die or be lost to follow-up. Although it is reasonable to limit follow-up in patients with extracapsular fractures that heal without issue (94.7%, in this study), it is important to continue monitoring for mortality until the fracture has healed. Failure to do so could explain the equivocal results of other studies regarding mortality after hip fracture. A limitation of the current study was that the authors lacked information that would have made this analysis truly granular. For example, it would be useful to stratify patients by fracture severity, quality of surgical reduction, experience of the surgeon, or general quality of medical care. However, it is not possible to impute information that is lacking in the original report. Even if some original reports provided such information, most do not, so it is impossible to stratify a meaningful number of patients by surgery-related criteria. In addition, a large number of studies on intracapsular hip fractures were excluded, as nonunion cannot be assessed in the setting of hemiarthroplasty or total hip arthroplasty. It is probable that the sickest and/or oldest patients with intracapsular hip fractures were preferentially treated with arthroplasty. Therefore, the difference in mean age and mean follow-up between extracapsular and intracapsular hip fractures may have been artificially enhanced. However, this highlights the high rate of nonunion for patients with intracapsular hip fractures; although these patients are considered young and healthy enough to treat with open reduction and internal fixation, they often fail to heal. Another limitation of this study was the inability to present the data of high-energy injuries in younger patients separately from the data of low-energy injuries in older patients, as these data were not sufficiently detailed in the included studies. The authors note that meta-analyses are prone to publication bias and are limited by the quality of the published literature. In this study, the authors imposed strict criteria in an effort to capture high-quality studies of the typical population of patients with proximal femur fractures. Weak studies may have been included anyway due to the limitations of this approach. The burden of proximal femoral fracture extends beyond acute disability, as it carries a high risk of long-term morbidity and mortality. Nonunion is a serious complication that greatly prolongs rehabilitation and introduces risk of further complications. Patients with intracapsular proximal femur fractures have a significantly higher rate of nonunion and unplanned reoperation than patients with extracapsular fractures. Plate fixation of displaced intracapsular fractures and nail fixation of unstable extracapsular fractures have lower rates of nonunion than alternative fixation methods. Choice of fixation method is critical to improving outcome for patients with proximal femur fractures. The reasons for the differences the authors report are obscure, are likely to be multivariate, and should be addressed with additional research. For example, it was proposed that nailing of a fracture of the hip and femoral shaft is superior to plate fixation because of improved functional bearing, increased rate of union, greater implant stability, and better mechanical solidity,37 and the current results were consistent with these conclusions. Mattan Y, Dimant A, Mosheiff R, Peyser A, Mendelson S, Liebergall M. Avascular necrosis and related complications following healed osteoporotic intertrochanteric fractures. Isr Med Assoc J. 2002;4(6):434–437. Parker MJ, Handoll HH. Gamma and other cephalocondylic intramedullary nails versus extramedullary implants for extracapsular hip fractures in adults. Cochrane Database Syst Rev. 2010;9:CD000093. The authors are from UT Health San Antonio (REKK), San Antonio, Texas; Louisiana State University Health Sciences Center (RZ, RGS), New Orleans, Louisiana; and Bioventus LLC (RGS), Durham, North Carolina. Dr Koso has no relevant financial relationships to disclose. Dr Zura is a paid consultant for Bioventus LLC and Smith & Nephew. Dr Steen is a paid employee of Bioventus LLC. Correspondence should be addressed to: R. Grant Steen, PhD, Bioventus LLC, 4721 Emperor Blvd, Ste 100, Durham, NC 27703 ( Grant.Steen@bioventusglobal.com).